I had some strange electrical issues where the blinkers wouldn't work, some of the speedo lights wouldn't work. 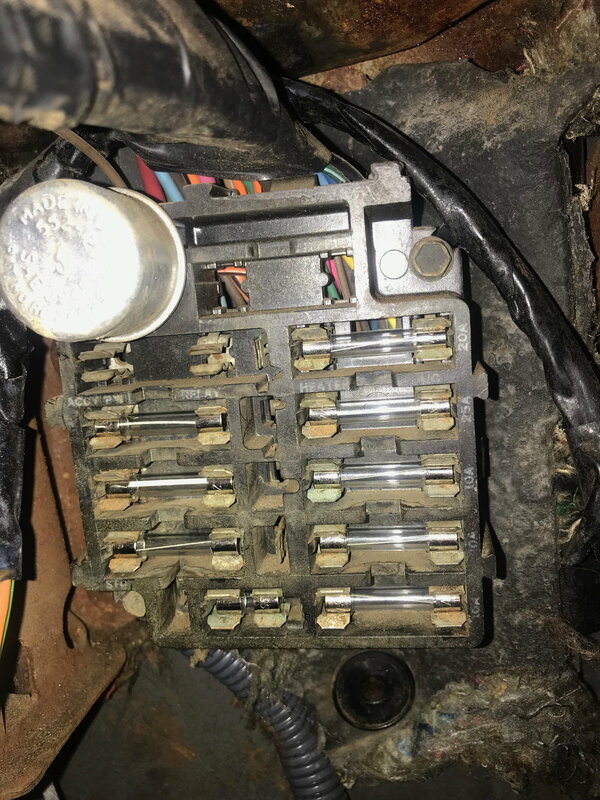 I replaced all of the fuel/speedo gauge lights, replaced fuses in the under dash harness and cleaned some of the rust off of it with a wire brush. Since then, none of the speedo lights work except for the hazard lights, the AC fan is constantly blowing (I can turn it high/med/low but won't turn off), sometimes the parking break works, sometimes the headlights don't work, sometimes turning the right blinker on causes one of the fuel gauge lights to blink. I replaced the turn signal assembly in the column and the turn signal flasher recently so those should be okay. Is it possible the dash harness is bad? Or is there another way to fix it? The car starts and drives fine. I even tried putting LED lights in the gauges (not in the blinkers), hoping that a lower power draw would help but it didn't. 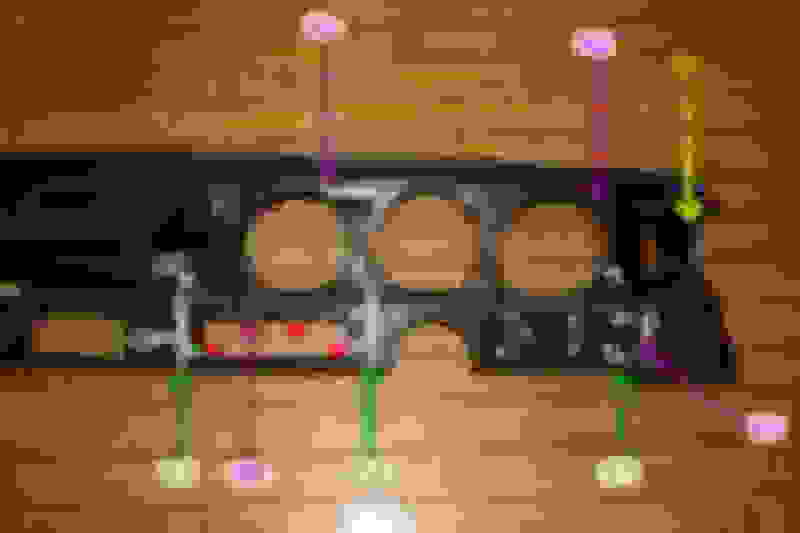 If I do replace the harness, is it better to use an exact replacement or one that uses the newer types of fuses? Thanks! 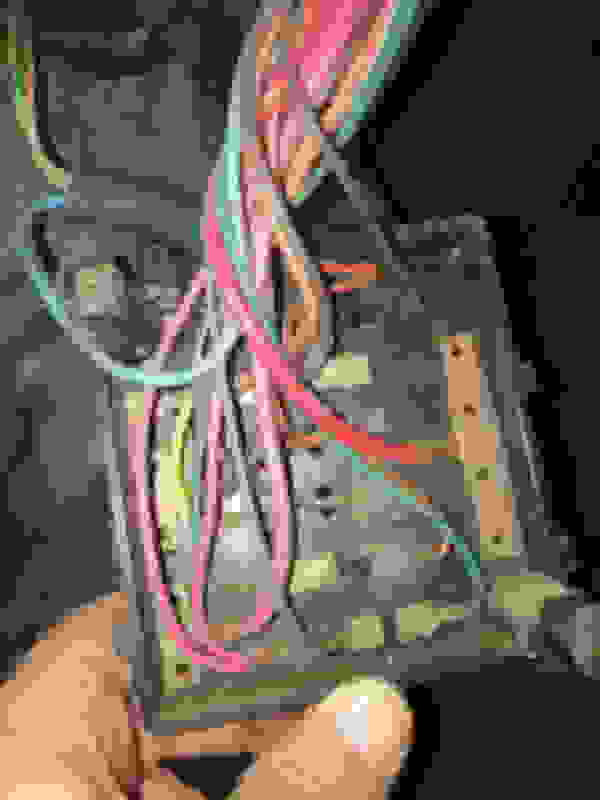 I just replaced my '72 Cutlass dash harness a few weeks back with a new M&H piece - exact duplicate of the original and of the typical high quality they're known for. yours looks worse than mine and I'd bet it's got gremlins you'll never find at this point. As to whether original or updated are better, that has typically been a debate subject forever. Personal preference is your guide there, I'd say it depends on whether you're upgrading the electronics of your vehicle in the process with modern accessory items - i.e. audio, gauges, engine management system equipment, etc. If staying stock, I'd vote for an OEM replacement to keep it a plug/play installation. It's a good amount of work to change the harness and if you haven't done one, the Olds harness will test your patience when you see how it's routed across the dash. I'm willing to bet that 90% of your problems are from bad instrument panel grounds. A harness replacement won't fix that. The grounds are sheet metal straps that tie all the electrical components together on the plastic dash. 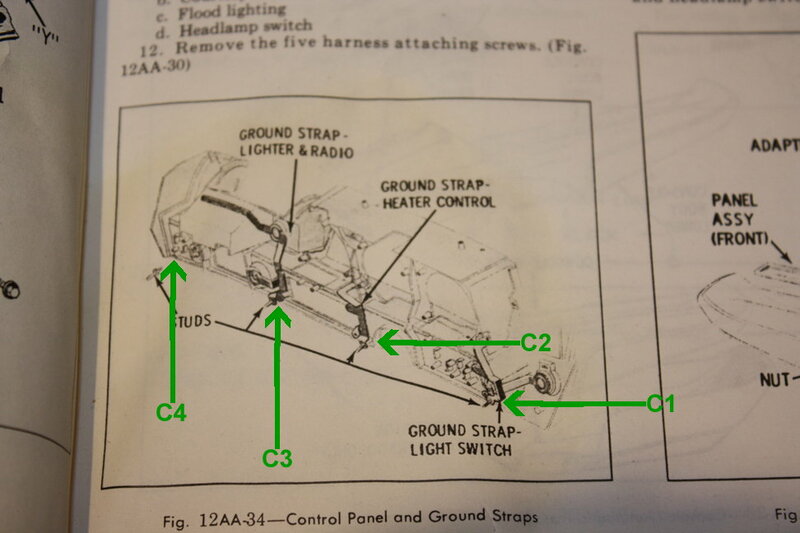 Also, if the car is an A/C car, the heater blower problem is a stuck high speed relay which is also unrelated to the harness. If the car is not an A/C car, then check the condition of the resistor. It often overheats and melts, potentially causing a short. You might want to spend some time troubleshooting before wasting a whole lot of time and money on a potentially unnecessary harness replacement. Yep, sounds like a grounding problem, or the other half of the electrical circuit. But its equally important. Thanks for responding everyone. I think I'll try troubleshooting first because its cheaper and the harness replacement sounds like quite a task. Can someone please tell me where the instrument panel grounds are and how I can fix the grounding problem? Firewalker, what/where is the other half of the electrical circuit? These are just formed sheet metal straps held in with self-tapping screws threaded into the plastic. 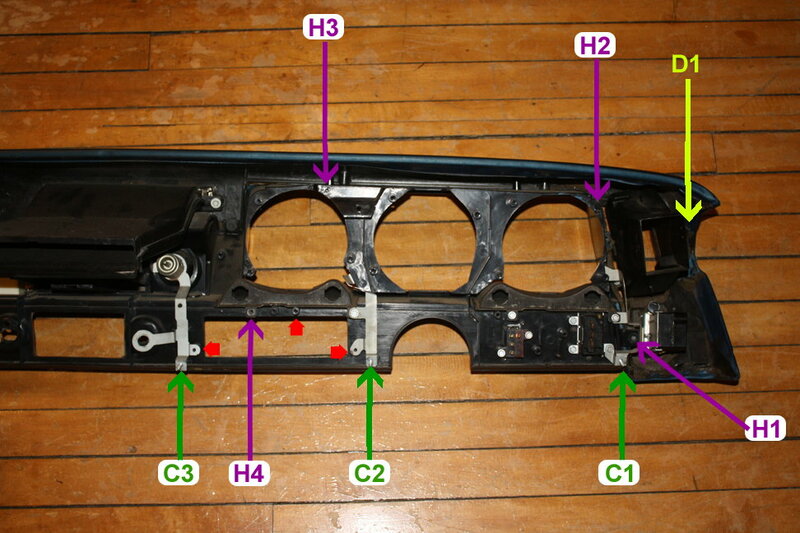 The mounting screws that hold the components to the dash and the studs that hold the plastic dash to the metal cowl provide the connections from components to the metal body. Screws work loose, and the connection gets intermittent. You can try temporarily connecting a jumper wire from the instrument housing to body metal as a test. He means that the power wire TO the component is only half the circuit. The electrons still need to get back to the battery, and that path is usually through ground straps and body sheet metal, not copper wires, on the ground side. Awesome thank you. 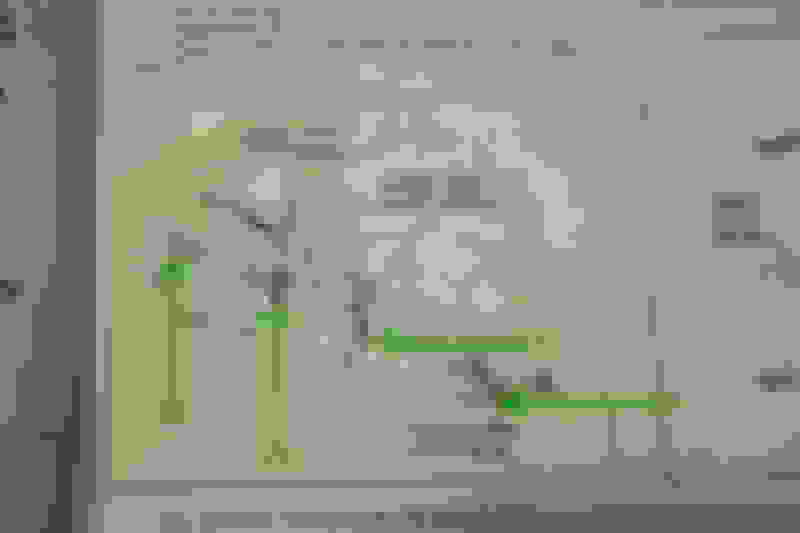 Those images are super helpful! So basically I'll need to pull the dash to tighten up the the grounds? Well, before going that far, I'd try running a jumper wire from the metal speedo housing to a metal ground point. You can reach that simply by removing the woodgrain gauge surround. If the speedo lights come on, then you know the grounds are the problem. If not, it's something else. By the way, a second common problem is the pins on the back of the gauge pods come loose. Check those if the jumper doesn't fix the problem. A few more things since you are new to this. Corrosion can block the electrical flow, like on a battery terminal. Paint will usually block it as well so bare unpainted metals needs to be grounds. The surest way for a ground test is a long wire, from the battery's negative terminal clamped to it, to whatever you are checking. Okay so we've got some form of progress lol. A better ground and now the turn signals work and signal lights on the speedo work correct, the high beams light works on the speedo. However, I still can't get the actual speedo lights around the numbers to turn on. Also the emergency brake light on the fuel gauge doesn't work either. I tried wiggling the wires in the back of the gauges but that only made the high beam speedo light go on and off. I did notice that the bad ground caused the blinkers to stop working properly. It would blink the high beam light on the speedo and the left speedo light on the MPH numbers (which is one that I can't otherwise get to work). I grounded it to part of the body and not the negative battery terminal. I'll try that later. In the meantime, any other troubleshooting or suggestions? Pull the speedo pod out of the dash. Ground the case. Apply 12V to the pin that the grey wire goes to. If the illumination works, the pod is fine. Now with the lights on, check the voltage at the grey wire in the connector. 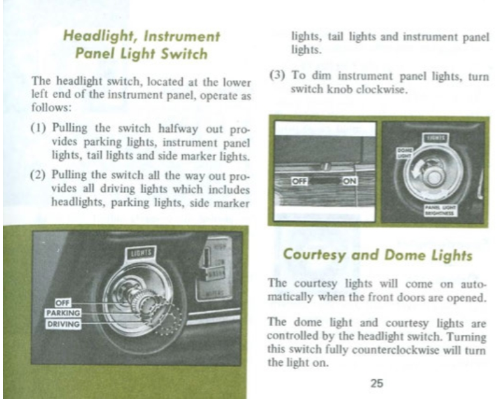 Twist the headlight **** to see if the problem is the dimmer. now the turn signals work and signal lights on the speedo work correct, the high beams light works on the speedo. However, I still can't get the actual speedo lights around the numbers to turn on. You might check to see that the headlight **** hasn't been turned to the right. It thermostatically controls the brightness of the dash instruments. So I can pull it out of the dash, I'm not sure what you mean by apply 12v to the pin (or not sure how to do that). Also not sure how to check the voltage at the grey wire. I have been twisting the headlight **** whenever I test but to no avail. Okay so I think I figured out the problem with the speedo. The gray wire that you mentioned is not giving any power to the speedo. I tried attaching the high beam wire to the pin that the gray wire goes to and both speedo lights worked with grounding the metal speedo housing. So thats good news I think. Although, I'm not quite sure how to fix it. I'm also still not getting the brake light to go on from the fuel gauge. These things are the shiznit for testing/troubleshooting this sort of stuff. Hook the alligator clip to any solid piece of metal (ground), insert the needle/pin/rod into the wire and see if that circuit has juice (light bulb will light). Get them at any hardware/parts store. Saves tons of time. While you're in there, I suggest you purchase and liberally spray down the dash pod(s) contacts, the headlight switch/rheostat extremely well. I'm not endorsing any particular product, but purchase the best you can. The really excellent contact/circuit board cleaners cost about $20-$30/can - but, they are far superior to the inferior products which cost much less. The cans I purchase from Fastenal run ~$25.00 each - they are superior for cleaning electronic/electrical contacts. Your wires, fuse box/harness, switches - in particular rheostats will love you for it. Went to my man-cave. This is the best contact cleaner I have ever used. Costs more at Fastenal, but I've had a hard time finding it in other stores. I've cleaned tons of circuit boards, etc. I can attest - this stuff is fantastic. Leaves absolutely no residue and cleans remarkably well.